Egypt, a country in Northern Africa bordered by the Mediterranean Sea, Libya, Gaza Strip, Israel, Red Sea, and Sudan has a total land area of 387,048 square miles and a population of over 79 million. The country also includes the Asian Sinai Peninsula. Except for the Nile Valley, Egypt is mostly desert in nature. Egypt is known as the Gift of the Nile and rightfully so for without it the entire Egypt would be a desert. Prior to the Aswan Bridge, the Nile enriched their soil, served as their highway, provided them with fresh water, food, and was the main resource for materials required for most everything - from construction to paper. Egypt's economy depends mainly on the income from the Suez Canal, agriculture, media, petroleum exports, and tourism. 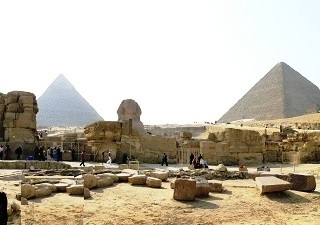 The pyramids of Egypt are by far the oldest attractions of Egypt and the biggest reason for its visitors. The three main pyramids of Giza and the enormous Sphinx outside have enthralled millions of visitors. Another mesmerizing attraction is Abu Simbel (rock temples). Other attractions include Cairo (city and museums), Valley of the Kings, Citadel, Nile etc. Egyptian cuisine is primarily vegetarian drawing heavily on legumes and vegetables from the rich Nile Valley. Egypt Eyewitness Travel Guides 978-0756666774 $17 Excellent illustrations and maps. Light on details. Egypt – Culture Smart! : the essential guide to customs and culture 978-1857333428 $10 Excellent companion to a travel guide book. Sections on Land and People, Values and Attitudes, Customs and Traditions, Making Friends, Private and Family Life, Timeout, Travel, Business Briefing, and Communication. Egypt Nelles Map 978-3865742216 $12 1:750,000 scale. The first stamps of Egypt were a set of seven stamps that feature Turkish overprints released on January 1, 1866. The set (Scott #1 to #7) catalogs for around $1000 MNH and $750 for used. Many varieties (imperfs, different perfs, diagonal half used, imperf pairs, etc) exist and some of them are even more valuable than the whole set. Muhammad Ali, the Egyptian leader at the time was still considered the Turkish Sultan’s viceroy in Egypt, although that subordination was just nominal. Nevertheless, the first issues had strong Turkish influence. The first original issues of Egypt were a set of six stamps released between 1867 and 1869 in the Sphinx and Pyramid theme. The set (Scott #8 to #15) catalogs for around $690 MNH and $250 used. Varieties of the same theme and certain overprints formed the Egyptian stamp issues till 1914. Many of these issues are very valuable although lower denominations can be acquired for a very reasonable cost. Egypt released a set of ten stamps on January 8, 1914 showcasing the rich history of ancient Egypt. The set (Scott #50 to #59) catalogs for around $75 MNH and $8 used. The designs show boats on Nile, Cleopatra, Ras-el Tin Palace, Giza Pyramids, Sphinx, Colossi of Thebes, Pylon of Kamak and Temple of Khonsu, Citadel at Cairo, Rock Temple of Abu Simbel and the Aswan Dam. A set of fourteen stamps released on February 1, 1934 showing portraits of Khedive Ismail Pasha. The set (Scott #177 to #190) catalogs for around $500 MNH and $200 used. The bulk of the valuation comes from the two highest denominations (Scott #189 and #190) with each valued upwards of $150 for MNH and about half that for used. Ismail Pasha was the Khedive (viceroy) of Egypt from 1863 to 1879. It was during his reign that a decree was signed confirming independence of Egypt (Khedivate – tributary state of Ottoman Empire) from the Porte (Turkish Divan). His reign was noted for infrastructure improvements, but that along with a costly war with Ethiopia landed the country in great debt. A set of nineteen stamps released between 1953 and 1956 to mark the change of government to a republic (June 18, 1953). The set (Scott #322 to #340) catalogs for around $50 MNH and $10 used. The designs show a farmer, a soldier, Mosque of Sultan Hassan, and Queen Nefertiti. A set of seventeen stamps released between 1964 and 1967 in the Ancient Egypt theme. The set (Scott #600 to #616) catalogs for around $30 MNH and $7 used. The designs show 14th century vase, ivory headrest, Pharaonic calcite boat, Minaret and gate, Nile and Aswan High Dam, Eagle of Saladin over pyramids, window at Ibn Tulun’s Mosque, Lion and Nile Hilton Hotel, Mitwalli Gate in Cairo, 13th century Vase, Nefertari, Tower Hotel, Sultan Hassan’s Mosque, Pharaoh Usekaf, Courtyard at Al Azhar University, Head of Ramses II, and Funerary mask of Tutankhamen. A set of seventeen stamps released between 1972 and 1976 in the Minarets theme. The set (Scott #889 to #904) catalogs for around $70 MNH and $15 used. The designs show King Khafre, Al Azhar Mosque, Luxor Temple, King Citi I, View of Alexandria, Queen Nefertari, Sphinx and Middle Pyramid, Cairo Mosque, and Head of Pharaoh Userkaf. A set of sixteen stamps released between 1993 and 1999 in the Artifacts theme. The set (Scott #1507 to #1521A) catalogs for around $13 MNH or used. The designs show bust, Sphinx, bust of princess, Ramses II, Queen Ti, Horemheb, Amenhotep III, head of a woman, woman wearing headdress, and Pharaonic capital. The first coins of Egypt were issued as early as around 320 BC during Ptolemy I’s reign. The coinage continued through the period of Cleopatra VII till around 30 BC. The Ottoman period saw the first Toughra series with heavy coinage based on Piastre and the second Toughra series with light coinage based on Piastre. Hammered Billon coins denominated in paras debut in the late 18th century. Milled coinage debut in 1834. Egypt has also released a number of gold coins over the years. Ancient Coins $10 and up Silver Paras from the Ottoman period starts around $10. Coins from Ptolemy era start around $20 and can go into the $100 range for authentic rare varieties. Ancient gold coins from 800AD onwards go well into the 100s. Other Coins $5 and up Common Piastres from the 1970s and 1980s start around $5. Silver Piastres from the 1930s onward starts around $15. Silver proofs from the 1990s start around $50. Year Sets from the 2000s, Silver Coins from the 1920s etc start around $100. Gold coins go well into the 100s depending on mintage and bullion value. Paper Money $1 and up Common UNCs from the 2000s starts around $1. Replacements from the 1970s onward starts around $20. Low numbers, high values, etc start around $50. Early banknotes in VF and bundles start into the 100s. The major takeaways are papyrus paintings with Egyptian symbols, perfume bottles, jewelry boxes, and brass plates depicting paintings of Pharaohs and Queens. Antiques $10 and up Handmade black alabaster curios and 19th century maps start around $10. Roman Egypt era linen textile fragments start around $30. 16th century bible fragments, statues, sculptures, oil lamps, and figurines start around $100. Art $10 and up 19th and early 20th century posters, photos, papyrus art paintings, art prints, and prints of historic documents start around $10. Original works by G.B.Belzoni, David Roberts, Arthur Secunda, and original Wilhelm Hammerschmidt photos from the 19th century start in the 100s. Culture and Ethnicities $10 and up Recent Neferetti and King Tut statues and sculptures start around $10. Some go into the 100s.